Updated: 7:25 p.m. | Posted: 4 a.m. Thanks to some near-perfect weather conditions, Minnesota's winter thaw has eased gently into a minor flooding season — so far. More than half of Minnesota's counties are experiencing some degree of flooding or ice jams this weekend. 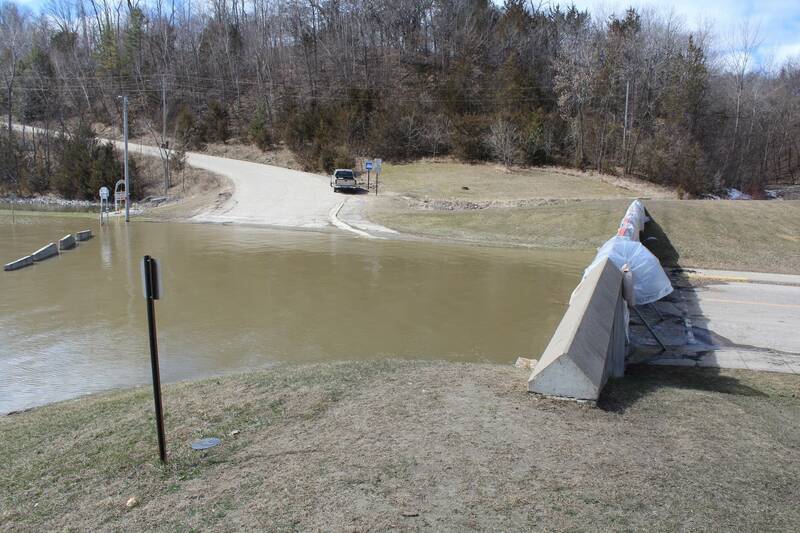 And while officials across the state continue to closely monitor river levels for the possibility of additional rises, their counterparts in the Red River Valley are adjusting their preparations — and their expectations — to the spring thaw conditions. 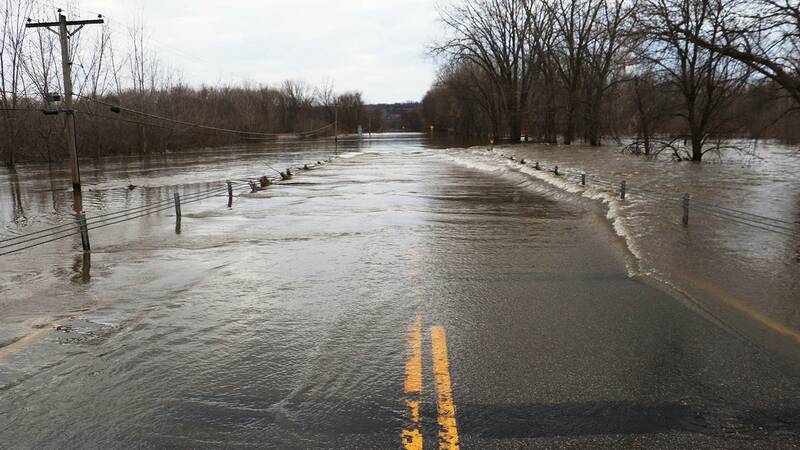 For Carver County, just southwest of the Twin Cities, localized flooding has so far meant manageable road closures for communities along the Minnesota River. 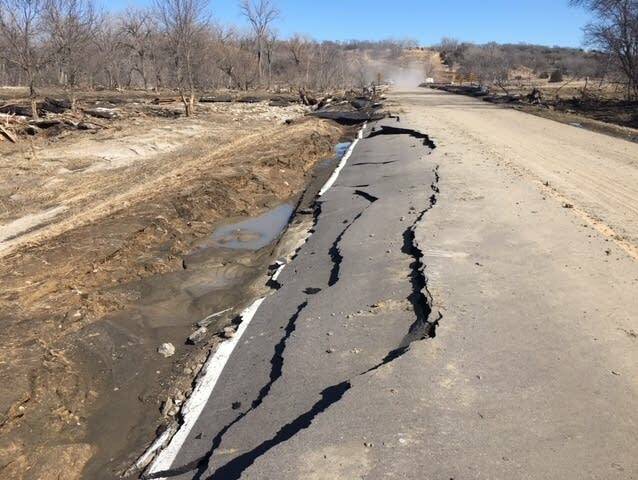 "The folks just know, because a lot of these roads are roads that typically shut down when it's a year of higher rivers," said county emergency management commander Debra Paige. "They almost anticipate it and are really good at knowing how to get around it." Paige says she's hoping for continued dry weather to keep it that way. But ice jams may still cause problems in the coming days, and river levels are expected to remain high over the next several weeks in central and southern Minnesota. MPR News reporters are monitoring rivers' rises across the state. Here's what we're seeing this weekend. The small Minnesota River valley town of Henderson is now in its third week of flooding along the river. 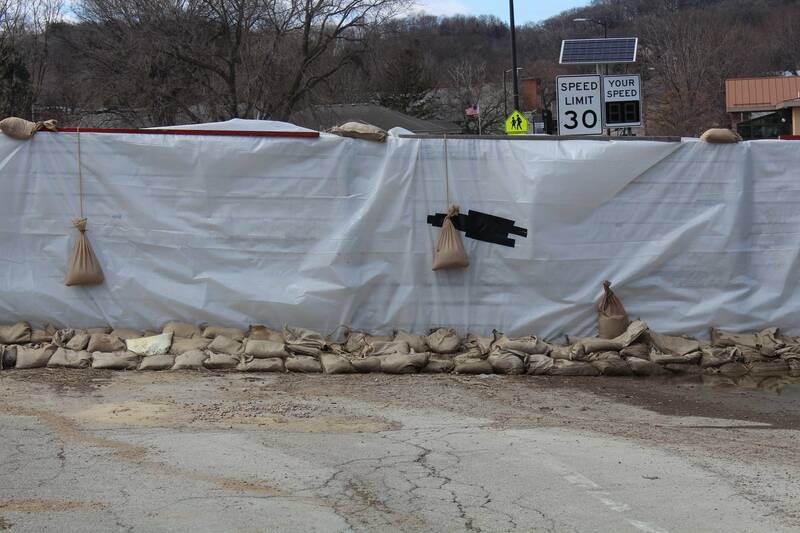 Three of the four roads into town remained closed Saturday morning as the frigid river water flowed up against levees and the temporary flood walls community volunteers installed ahead of the river's rise. There's not much hope for the floodwaters to recede in the near future, either. After dropping a bit in the past week, the Minnesota River near Henderson is expected to rise again over the coming days, cresting again on Thursday. The only way into Henderson currently is from the west on State Highway 19; the highway becomes Main Street once it hits Henderson. The local restaurants, shops and bars on that stretch rely on traffic from out-of-town visitors, and flooding is slowing business. It's causing transportation hassles for residents, too. Mary Menne, who lives in Henderson with her husband and their children, said the road closures are forcing school buses to take different, longer routes. "It's a lot of gas and a lot of time, additional time for kids," she said. "Adding 30 minutes to an already long bus ride is a lot." 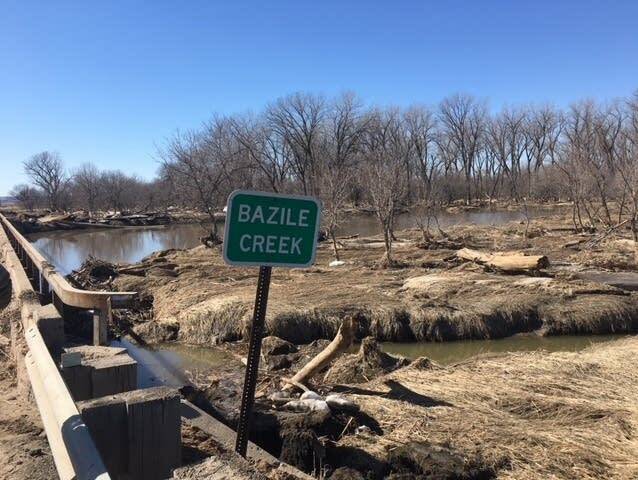 By the time Eric Zimmerman arrived in Nebraska earlier this month, the devastating floodwaters that had overwhelmed parts of the Santee Sioux Nation's reservation had begun to recede. But the Missouri River was still high and overflowing, the only main road in and out of the community had been washed out, and a loss of power and water had taken the community's medical clinic out of commission. That's why Zimmerman, deputy chief of public safety and fire marshal for the Shakopee Mdewakanton Sioux Community, was there. He and another member of the community drove its mobile health clinic to Nebraska for the Santee clinic's providers to use while their own clinic was out of commission. "We provide the clinic to a lot of tribal nations," Zimmerman said. "We can provide it as basically just a doctor's office, which is what we did on this deployment. We can also do screenings for cancer, and take along equipment to do dental-type deployments." The Shakopee Mdewakanton Sioux Community says its mobile health clinic has been deployed 600 times since it began operating in 2007. It's a 53-foot semi-truck with sides that slide out — like in an RV, Zimmerman said. When it's fully expanded, the clinic has a waiting room in the center, an X-ray suite in the front and a doctor's office in the back. It's fully self-sufficient: Runs on a generator and has its own heat, air conditioning, water tank and internet. "So when you're in an area that has none of those services," Zimmerman said, "it can bring it all with it and doesn't require any outside assistance." 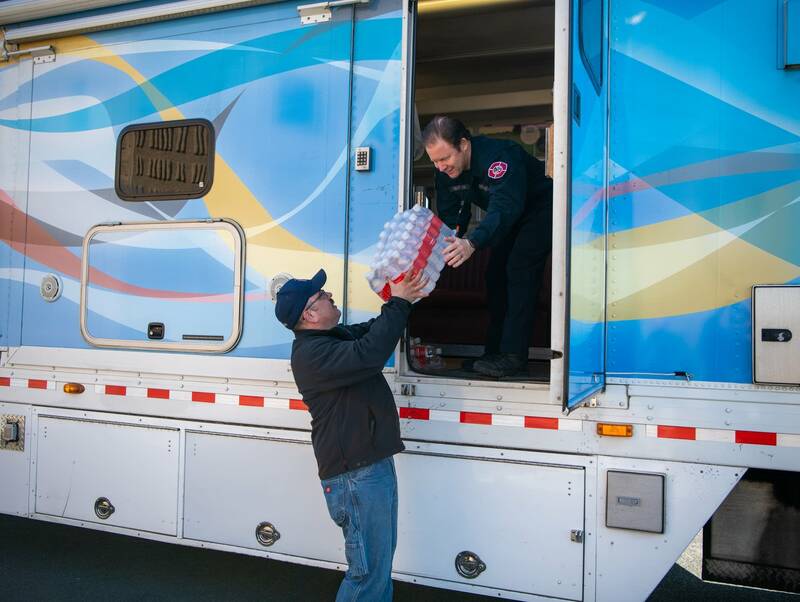 In Nebraska, the mobile unit became a place where the Santee clinic's health care team could treat patients, refill prescriptions and offer follow-up care. 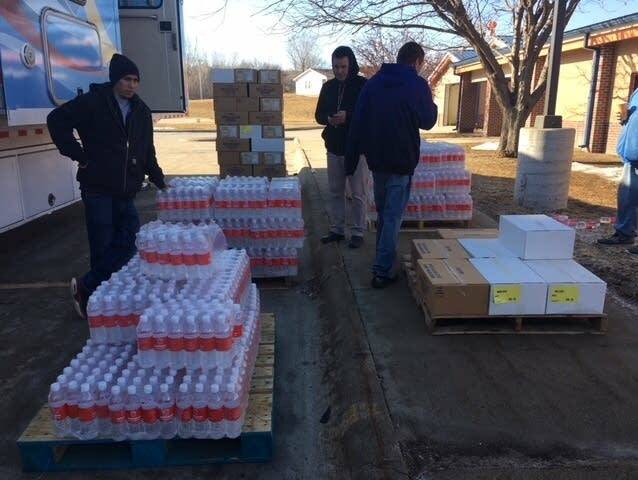 The Shakopee Mdewakanton Sioux team also brought several pallets of bottled water and freeze-dried food along with them. "They needed all the water they could get," Zimmerman said, "so it was really nice to be able to take them truly what they needed in water." The Santee community had been without power and running water, cut off from the rest of the world, for five days, Zimmerman said. The reservation, in northeastern Nebraska, experienced exactly what meteorologists in Minnesota were concerned about earlier this month, as flood season loomed: A long winter with heavy snowpack, followed by a rapid warm-up and a rainstorm on top of the melting snow. The community sits on a slope along the southern banks of the Missouri River that forms Nebraska's border with South Dakota. The combination of rain and snowmelt, Zimmerman said, created a ripple effect up and down the river. It inundated the community and a creek that runs within it. The overflowing creek carried jagged sheets of ice along with it as it flowed into the river. And then the ice jammed up against a bridge that crosses the Missouri. The ice jams forced the water up over the main road and into the community, Zimmerman said. "There was no way in and no way out until the floodwaters receded," he said. "They were able to fix the road to the east, so that's now passable. But for 5 days they had no electricity, no water, and no vehicle access out of the community." The normally dirt or gravel roads were washed-out or soft and mostly impassable, Zimmerman said. Emergency crews had to transport sick or injured community members by ATV for several days. Zimmerman said he was glad to be able to assist the community as it began its recovery from the flooding. "It's very fulfilling," he said. "You get the opportunity to help lift them up when they're down." So far, Zimmerman said he's not anticipating a need to deploy the mobile unit closer to home in Minnesota. "The floodwaters really didn't come up as much as they said they would," he said. "There is a lot of flooding along the Minnesota River valley, and there are a lot of tribes along the Minnesota River valley, so there's still a chance that we could deploy. I just haven't heard of any possible deployments yet." The main impact of the spring thaw so far has been on drivers, who have faced road closures primarily in southern Minnesota. A handful of highways remain closed this weekend as floodwaters continue to run high. MnDOT maintenance engineer Jed Falgren, who's based in Mankato, said crews have been busy. "We went from plowing snow to patching potholes and dealing with floods all in a matter of a couple of days," he said. And despite the sunshine, Falgren says flood season isn't close to being over. "As the spring goes along, there may be some additional rains that come in. We know that the soils in our part of the state are very saturated, so most of the rain that would fall or could fall will end up running off quickly," he said. "So we'll be keeping our eye on rivers for quite some time." Falgren said crews will continue to monitor roads and will assess any damage before reopening them. MnDOT is using drones to help anticipate where crews might need to spend extra time on repairs once the flood waters recede. Have you ever seen a flood wall in action? "We're looking at the flow pattern of the water as it goes across the roadway. If there is more erosion that may happen on the downstream side that begins to undermine the pavement, we can actually see some additional damage begin to form," Falgren said. "There's nothing we can actually do about it [at this point], other than just be prepared in the event that we see more significant damage." Falgren said MnDOT has also used drones to survey new projects, monitor flooded roadways, and to show the public the extent of spring flooding through its social media accounts.